TENNESSEE WILLIAMS Returns to New York! True to its name, there are only two players in “The Two Character Play”, one of Tennessee Williams’ so-called “later” works that is enjoying a rare and much-deserved revival courtesy of New York City’s 292 Theater. As it turns out, the number of characters may just about be the only thing we can be sure of in this truly unique theater experience. To say that 292’s production gives respect to Williams’ original artistic vision is only the beginning. The play, directed by Romy Ashby, features a pair of actors who take on the two difficult roles with gusto. This isn’t escapist, “feel-good” theater– at least not in the classic sense. With its searing psychodrama laced with black humor, the play draws you into the characters’ goldfish bowl of a world to the point of being just a bit disturbing. Claire (Regina Bartkoff) and Felice (Charles Schick) are middle-aged sister and brother. They live in a house that may have once been eccentrically charming, but is now just dilapidated and cold, both literally and figuratively. Claire and Felice are also actors, and we learn (or, at least, we are TOLD…) that they have been abandoned by their traveling theater troupe. Nevertheless, the siblings decide to rehearse and revise their long-gestating performance piece– the “two character play” of the title– to an imaginary audience. The result, for you and I (the actualaudience), is a “theater within a theater” experience which will inspire more mystery than revelation. Being actors, we never truly find out what is real and what is acting. At one point, some truly dark family secrets are confessed as Claire engages in a phone conversation with a holy man. She is so convincing that we think her story may be real. Or is she just a good actress? If it IS real, it would certainly explain a lot about why the she and her brother are the way they are. Still, we never really find out. In fact, EVERYTHING about Claire and Felice’s lives– and subsequently, the story– comes into question. Are their decaying surroundings their “real” home, or is it the theater set? Is Claire mentally unbalanced, or is Felice? Or, are both of them a bit detached from reality? Are the characters’ situations and stories real? Is it a script? Or is everything they say and do part of an impromptu performance piece of sorts that unfolds and changes in real time? Maybe it’s a combination of all of these. The actual audience is constantly wondering and searching for clues until the very end. Upon its initial unveiling to audiences, “The Two Character Play” was described by some critics as “plotless”, “absurdist”, and “difficult to follow”– and it was a commercial failure upon its premieres, in various forms, in the 70’s. Unlike so many of Williams’ earlier and more famous works, this play is rarely produced today. Yet, some historical perspective is called for: By the 1960’s, Williams was drifting towards a different style of writing, and neither audiences nor critics were quite willing to accept his “new” artistic pathway. It is worth speculating, then, that many of his later, more renegade plays may have been dismissed en masse by audiences and critics rather than being judged individually by their own characteristics. 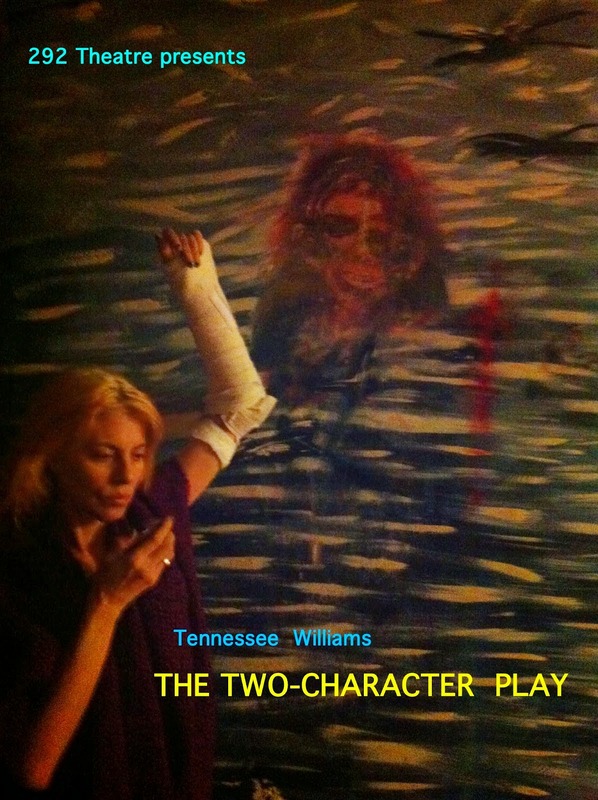 Had “The Two Character Play” been written by a lesser known author, it may have been regarded as a bold experimental piece which continuously challenges the audience, and one that would no doubt start some lively after-theater conversation and debate when the curtain fell. (It surely did with THIS writer…) On the other hand, a large part of the play’s appeal is the fact that this was indeed one of Williams’ most personal and autobiographical pieces, by both the author’s own account and by the observations of his peers. For that reason alone, the play is a must for fans of Tennessee Williams– both the man himself and his body of work. When the characters speak about life in the theater– a world of its own, governed by its own rules– it is blatantly obvious that Williams was speaking from an insider’s voice. The same holds true for the characters’ sense of isolation, confinement, and their possible blur between what is real and what is fantasy. We see how the tortured soul (of which, as we know, there are MANY in Williams’ works…) often finds himself/herself trapped in a situation not because they want to be, but because they know no other way. Claire states near the play’s final moments, “I realize now that the house has turned into a prison… but it’s not a prison that is unfamiliar with us”. The intimacy of the 292 Theater (20 seats) works perfectly to enhance the characters’ assorted neuroses. Again, “The Two Character Play” challenges the audience in a big way. While we’re on the subject of challenge: It is a real test of one’s acting talent and dedication to be in a play with only two characters who are on stage for the entire running time. Both Bartkoff and Schick pass that test with flying colors. Bartkoff’s Claire may seem like the more showy role of the two at first. Indeed, the actress’ big, penetrating eyes alone can speak a thousand words with one expression, even in scenes when the lighting is dimmed. When Claire glares at Felice from across the stage, she may as well have been firing a cannon. As the equally eccentric Felice, however, Schick requires just as much and sometimes even more acting energy to keep up with (and, at time, compete with) his tempestuous yet fragile sister. As we learn in the program, Bartkoff and Schick are real-life husband and wife. Their real-life closeness is nicely translated into an overt chemistry on stage together, although the relationship between the characters they are playing is unsettlingly co-dependent. In “The Two Character Play”, Williams does not give us the easy sense of closure at the end that we may have been hoping for to “explain” things. (After all, we know how theater-goers love a nice, neat conclusion, don’t we?) By the final scene, however, when we have to pick whether Claire and Felice are living in delusion or in reality, the selection may become a little bit easier. Thanks to the expert cast and direction, the road to whatever conclusions we ultimately reach is fascinating to watch. This revival is highly recommended. “The Two Character Play”continues Wednesdays through Saturdays at 8PM through April 12th at 292 Theater, 292 E. 3rd Street, New York City. For more info and tickets, visit http://www.292Theater.com. Previous Movie Review: "Southern Baptist Sissies"
Next RICHARD PRYOR JR. at THE METROPOLITAN ROOM: The Son Rises at Night!